A little while ago, my husband went to work and came home carrying a huge flat brown box. It turned out to be an innovative ready-assembled desk and chair 'system' known as The Edge Desk. What follows is my personal opinion of it. I only ever recommend products I like to use, and that I think my regular readers might like too. I am not being paid for this post, but have arranged a reader discount, detailed below. Billed as the ultimate desk for productivity, The Edge is an all-in-one desk and ergonomic chair. 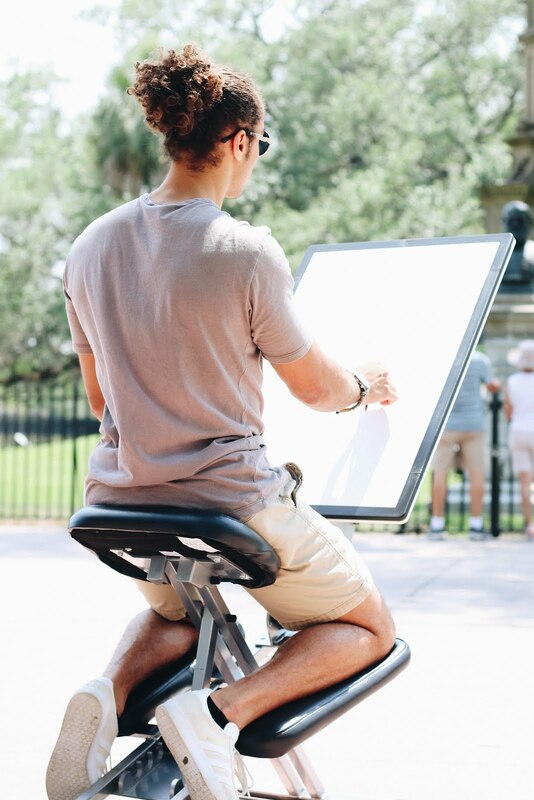 It can be used flat or slanted - in landscape orientation - for use with a laptop / paperwork or books, or it can be flipped into portrait orientation and used as an easel. As I love to draw and to type, I was keen to give it a try - a few lever-pulls and knob-twiddles later, it was all set up. The most noticeable thing about the desk is the built-in ergonomic seat - I had never tried one like this before, and am now completely sold. It's incredibly comfortable and gives me a much better posture when seated - at 5'3" my feet often don't touch the floor with a regular chair, and I tend to tuck one beneath me. As the Edge is easily adjustable to various heights, and I don't need to touch the floor, I find it considerably more comfortable than my regular office chair and incredibly stable. As I said, the desk and chair are ready assembled, and flat-packed. You just need to erect it to your desired settings and it's ready to use. 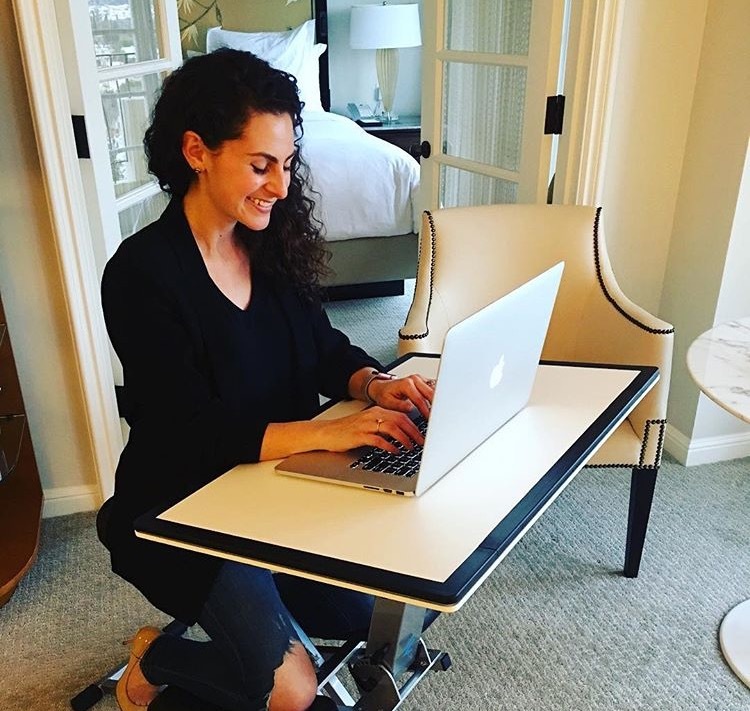 Once you know how, you can put it up and down in a minute or so and it will slide under a bed, or behind the sofa until you want to use it again - it is literally a pop-up office! Perfect for a studio apartment, or small sitting room, or perhaps turning your guest bedroom into an office space that can be tidied away quickly. Depending on usage, I consider there to be a few small limitations at present - when using the desk as an easel there is currently nowhere to put a pot of water. Similarly, if using it as a slanted desk with a laptop, there isn't anywhere to put my tea cup. Without an anti-slip case, I think my phone would slide off it too. These issues are being addressed in the next few weeks with the launch of clip-on accessories including a cup holder, a phone holder and wheels, making it easier for anyone to move it across the floor. (Being so sturdy, it is quite heavy.) Finally, as a tactile person, I would love it if the plastic desk surface were a bit more attractive, but that's really a matter of personal taste (and as it's put away when not in use, it's certainly not a deal-breaker). When I'm using the desk as an easel, my paper is easily taped to it with masking tape, and it's quick to clean afterwards, so it is very practical. We are incredibly fortunate to have 'his and hers' permanent offices at home - "his" is an edit suite (for which we sacrificed the smallest bedroom) and "hers" is my tiny downstairs craft studio. So why did my husband bring one of these home? As a film / TV editor he sometimes needs to be on location. The Edge desk fits in the boot of his car and it's easy to take it with him, to work with his laptop. While he's not on location, I have been using the desk to work or paint in the garden during fine weather. The kids (age 8 and 10) have used it to do their homework in the sitting room where there are only small side-tables. It comfortably fits each of us and we have even been known to squabble over who will use it next. Edited to add: My husband is a whole 30 cm taller than me, and it fits him just as well! After a few months of use, I consider The Edge desk to be incredibly versatile, comfortable and well-designed. This is reflected in the price-tag, but I think anyone looking for a 'pop-up' work space would find it worth investigating further - especially if you don't have the space or the desire for a permanent dedicated office, or you're not always in the same location. You can find more photos and videos of the desk in action, plus lots more technical information here. The Edge Desk UK have informed me that all online orders are sent out by courier for delivery within 2-3 working days in the UK. They are happy to offer readers a £20 discount off the purchase price if using the code CWTCH20 before 30th June 2017. We once had a chair like this (without the table) that should allow a healthy posture. What an interesting combination. I was thinking this looked good until you said nowhere to put my tea!! Actually, apart from that small oversight this does look like a great versatile small desk system. I remember the first thing I looked for when I changed my car was cup holders. these things are important! Hi Julie, thank you for your valued comments! The first accessories have been in design, tooling and production for the last couple of months but I'm pleased to say that these should be arriving in the UK by the end of July. We too think that a place for your tea is a 'no brainer' so you'll no doubt be pleased to know that among the first accessories will be a clip on cup holder (which also doubles as a pen/brush holder)! Also arriving will be a phone holder and a set of clip on wheels which, when folded, will enable the desk to be moved like a trolley, making the Edge Desk even more portable that before! Best wishes, The Edge Desk UK.